Raspberries are delicious! And super-healthy! They come loaded with antioxidants, vitamines, and minerals like iron. Around 1/5 of their weight consists of healthy dietary fibres: Not bad at all for one of the main ingredients in a delicious ice cream. 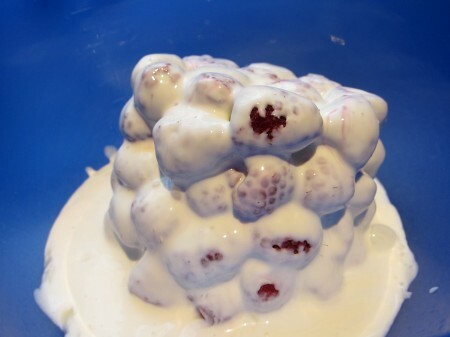 So, without further ado, let me share with you my very best raspberry yoghurt ice cream recipe! I really LOVE berries. Not only are they delicious – most of them are also really healthy … unlike a lot of other sweet edible things in life. And up there with blueberries, red raspberries top my personal berry-favourites list! You can imagine my happiness then when, on a sunny summer day in Stockholm a couple of years ago, one of my sisters-in-law came by … bringing with her a whole ice cream parlour-sized batch of the most delicious raspberry frozen yoghurt I had ever encountered! Ah – The clear berry flavour, the smooth texture, the freshness brought about by the yoghurt … it all came together, forming one of the best ice cream experiences I have had. And now, after some tinkering, I believe I have found a way to re-create that experience! 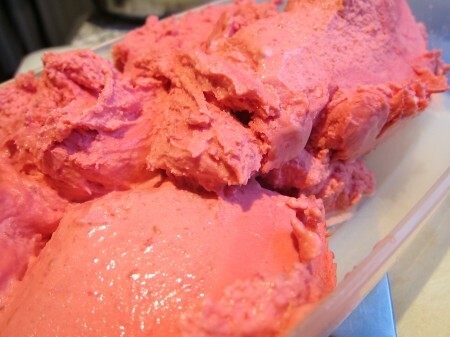 And not only that – this truly terrific raspberry yoghurt ice cream turns out to be incredibly easy to make! 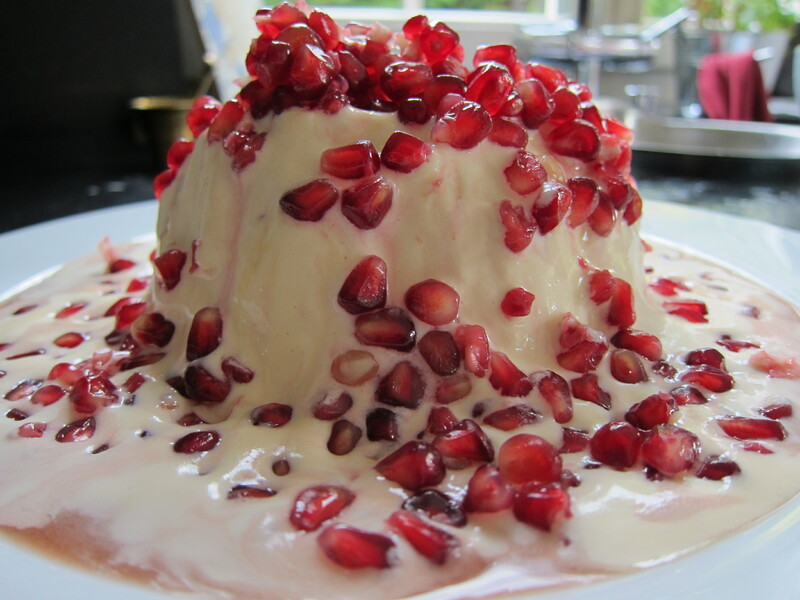 Relatives of mine who have tested to prepare this recipe without an ice cream machine also report good results. As I told you, the recipe is really super-simple: All you have to do is to mix all the ingredients together, making sure that the raspberries are properly puréed in the process. What about the seeds of the raspberries? As avid readers know, I normally like to keep seeds and this ice cream is no exception. Should you, however, have issues, do purée the raspberries and pass them through a sieve, if seedlessness in ice cream is very important to you:-) . I have it from a highly credible source – my dear mother – that this recipe easily can be prepared also without an ice cream machine. When still-freezing in your freezer, just remember to take out the ice cream base about every 45 minutes and whisk/stir through the mixture thoroughly in order to break down the unpleasantly large ice crystals that otherwise will form. Repeat another two-three times during the next hours. The first time you do this, it will usually be sufficient to whisk around the base with a fork or so. When the ice cream begins to freeze more, however, you should consider using a mixer, an electric whisk or similar to really give the base a “thorough treatment”. Don’t ignore this manual churning – it will make all the difference in the world for the texture and character of the final ice cream. If still-freezing, you might also consider to add 1-2 tablespoons of neutral alcohol (like vodka) to the ice cream base. This is not primarily for any reasons of flavouring, but in order to improve scoopability, making the final ice cream softer. What can I say? 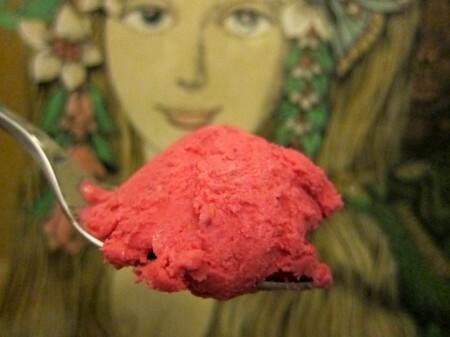 Simply that this is one of the best, no – THE best raspberry yoghurt ice cream that I know of! 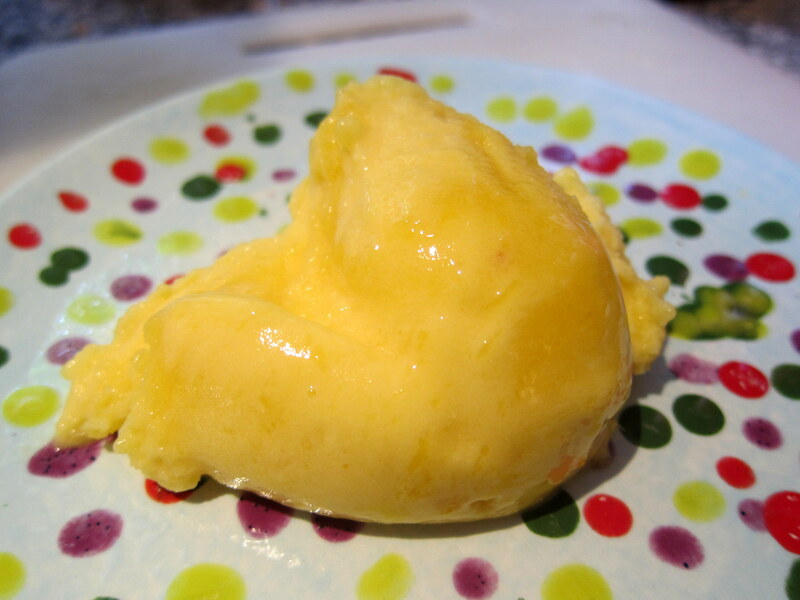 I hesitate to label it ‘frozen yoghurt’, since there is an equal amount of cream added in the recipe. However, the match between the key ingredients is a match made in food heaven! Add then that making this ice cream could hardly be easier … with or without an ice cream machine. 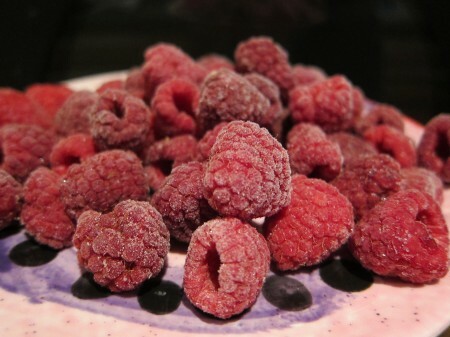 If you like raspberries, there are simply no excuses: Just go for it! 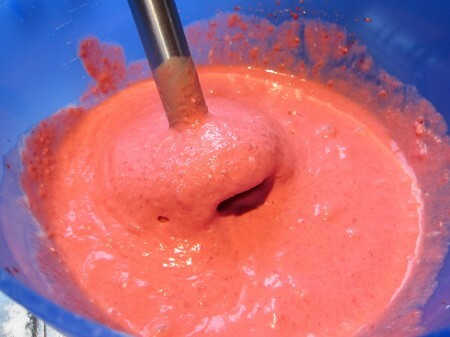 Put all ingredients in a bowl, blend thoroughly, and purée with a mixer or equivalent. If needed, chill the blend in the refrigerator. I agree – no excuses: go for it! Incredibly easy to make and DELICIOUS! 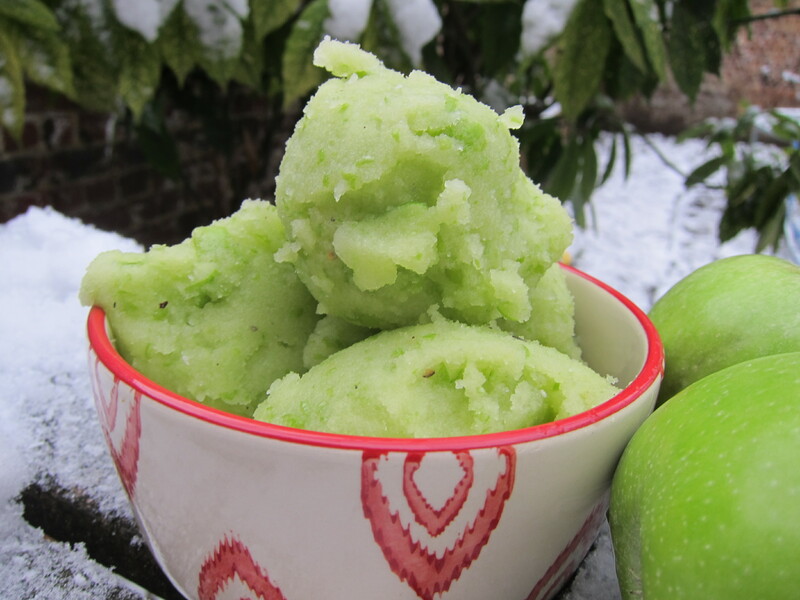 Great recipe thanks will give the still freeze method a try. Can I substitute the sugar for stevia or other sweetener suitable for diabetics? Sure, you can substituting the sugar for stevia. In fact, this is something I have tested myself for this very recipe, so I would suggest that you check out this post. There, I also discuss the consequences of not using sugar (mainly, that the ice cream is bound to freeze very firm) and what could be done about that. Good luck! This recipe is absolutely amazing!!! I’ve made it so many times already! And today i replaced the raspberries with frozen blueberries. Turned out wonderful!